Children learn eating behaviours early, according to a recent study, and parents can help them listen to their internal hunger cues and learn to eat treats in moderation. 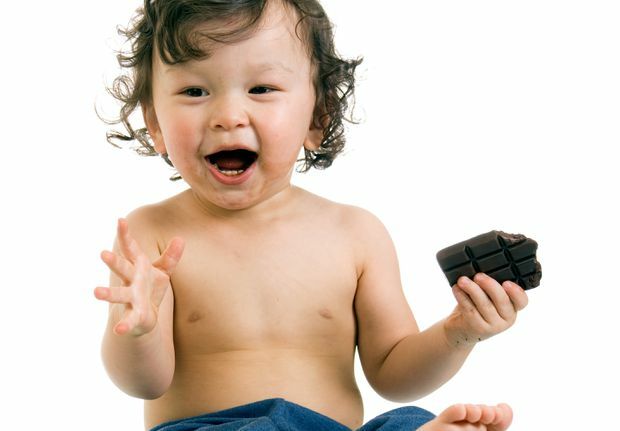 Happy children eat more chocolate than children in a neutral control group, according to a recent study. Shayla C. Holub, a psychologist at the University of Texas at Dallas and Cin Cin Tan of the University of Michigan, looked at the relationship between children’s emotions and their developing eating habits. Title: Good News; More good news: Need some good news in your day? Read our collection of uplifting and inspiring stories. “We were looking at emotional eating behaviours in kids. So we induced moods,” Dr. Holub says. Their study, published online in the journal Appetite, put children aged 4 ½ to 9 in front of different video clips from Disney’s The Lion King. They showed children a happy scene, a neutral scene and a sad scene (spoiler alert: it involved what happens to Mustafa). The children were given the option to munch on either chocolates or goldfish crackers while watching. It’s fine to do everything in moderation. It’s when we use food to praise or to reward that the dangers lie. · Children watching the saddest video clips ate the most chocolate among all the groups, mostly passing on the goldfish. · Children watching happy scenes ate less chocolate than the sad ones, but more than the children watching neutral scenes. · Children who viewed the neutral parts of the movie went for the goldfish crackers more often than the chocolate. · Children who watched the happy scenes ate fewer goldfish than those watching the neutral clips, and the children watching the sad scenes ate the fewest goldfish of all. The study offers insights into how children learn and develop relationships between different kinds of food and different situations, Dr. Holub says. “Children begin to associate food with certain feelings,” she says.” For example, they learn early in most cultures that chocolate is a “happy” food, associated with birthday parties, treats and holidays. So feeling bad might make them prone to cheer up with a chocolate; mind you, if they are already feeling good, they will go for chocolate, too. And crackers tend not to be associated with any emotionally laden situations. The research can help parents and teachers of preschoolers to understand more how eating habits develop from social situations, Dr. Holub says. When they are babies, their metabolisms adjust to eating so that they are neither hungry nor too full. As they hit pre-school age, children respond more to emotions and situations connected to particular foods. “It’s fine to do everything in moderation. It’s when we use food to praise or to reward that the dangers lie,” Dr. Holub says. For example, telling children they must finish everything on their plate can cause stress, she explains. What about telling children that the Easter Bunny is actually a bigger fan of healthy carrot sticks than chocolate? “It’s okay to have treats,” says Dr. Holub, who has a 4-year-old boy and a 6-year-old girl. As Dr. Holub says, “It’s okay to have treats,” whether adult or child. This special edition “Ziggy Stardust Disco Egg” by trending Toronto chocolatier CXBO Chocolates ($50) is on the fancier end of what may satisfy your inner child.